For the month of June, Stu’s Shed readers are being given a special code to get a 15% discount on a new range of machinery from I Wood Like. So just what are the new tools that IWL have on offer? 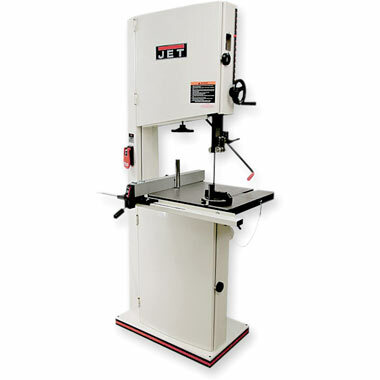 There are two new bandsaw models. 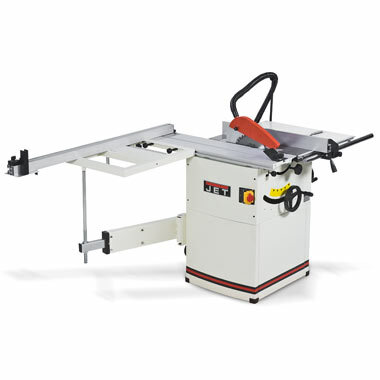 This is a 305mm twin speed bandsaw with a maximum DOC of 200mm. Priced at $1190 inc GST, it has been reduced to $1011.50 with your Stu’s Shed discount. 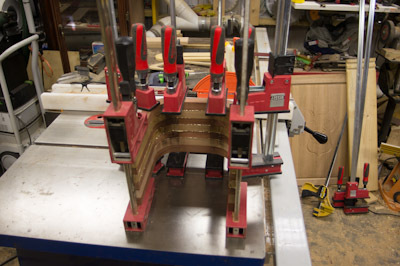 With a 390mm throat depth, 270mm resaw height and a 2.2kW motor, this bandsaw will do some pretty significant work. It can take up to a 30mm blade, so that really opens up the options for getting carbide tipped blades for serious resawing. It is priced at $1949 inc GST, which comes down to $1656.65 with the Stu’s Shed discount. 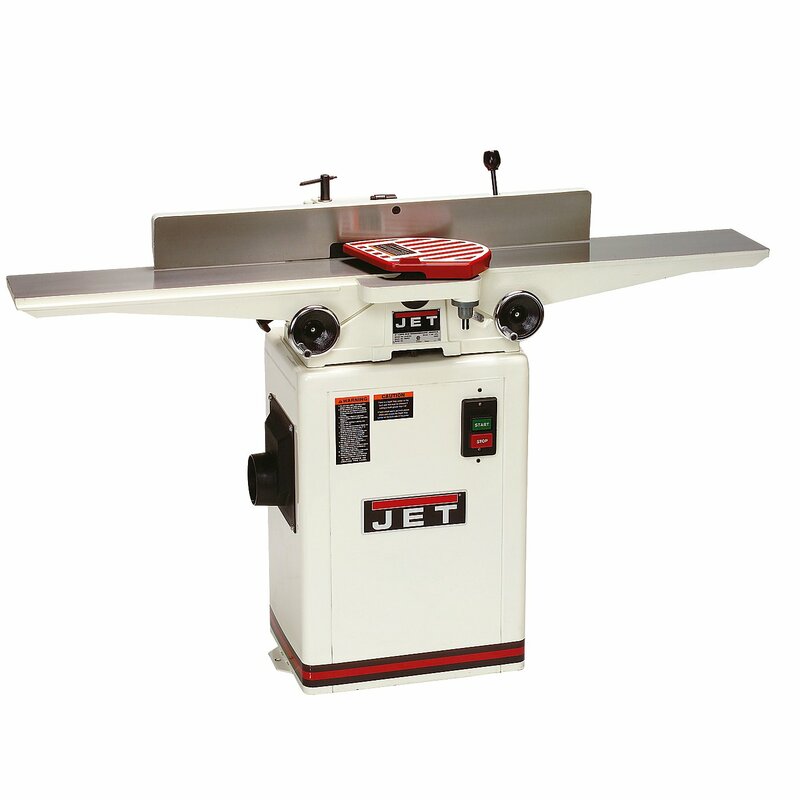 There are a couple of combo jointer-thicknessers, and a couple of smaller sanders (linisher and or disc) that I will highlight in the near future. 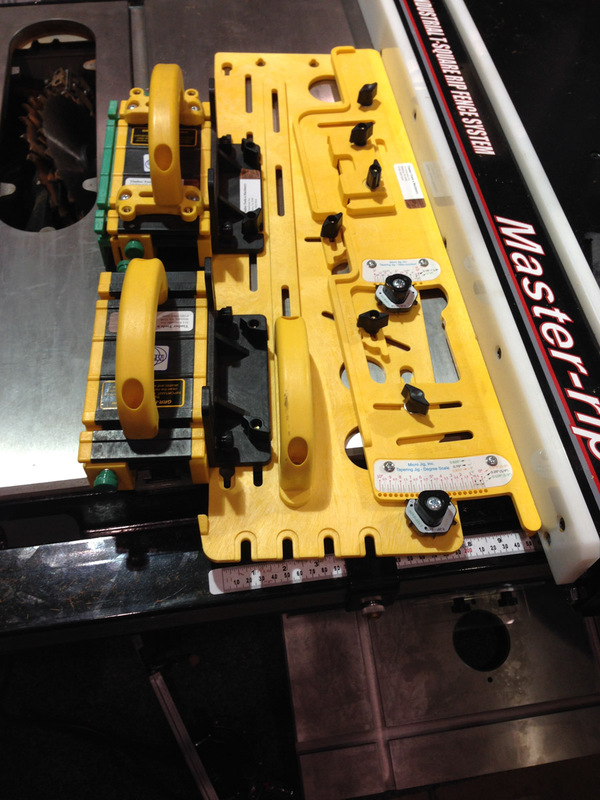 Grr-ripper colours (and with Grr-rippers attached), but is actually a taper ripping jig, heavily engineered. Has stops for repeatable setup, positive setting positions, and locations for connecting one, and two Grr-rippers. From there, I had a closer look around the stand (having just signed up for “citizenship” of LagunaNation – with the passport coming in the post shortly – interesting marketing campaign). Not the best photo, but they had just finished resawing some Huon pine into a 2mm veneer. Their triple variable skip carbide toothed bandsaw blades are quite impressive! 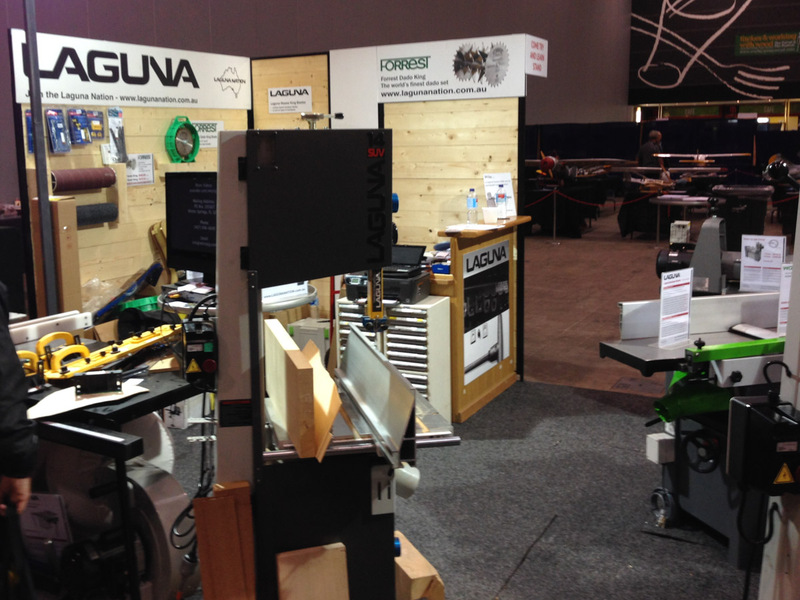 They also have Forrest blades (at least the dado, not sure about the Woodworker2) – for a long time Forrest was not interested in the Australian market – glad someone was able to change their minds. 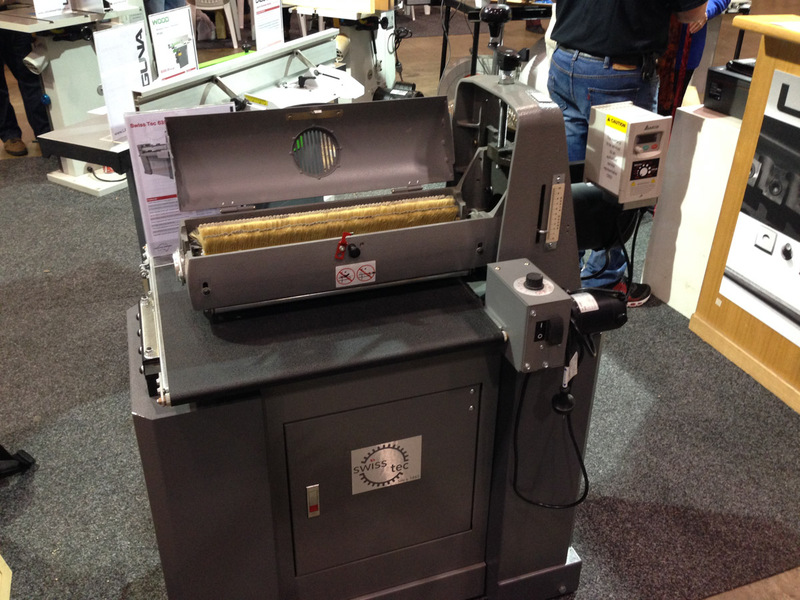 At first glance, the drum sander (Swiss-tec) is similar to the Carbatec one, but then the stand is enclosed, there is an extra control box which varies the drum speed, and not the the feed belt speed, and the drums a (relatively) easy to exchange, so you can go from the traditional wrapped sandpaper drum to a flap sander (with brushes backing up the flaps so they last longer), or a silicon-carbide brush drum. Their CNC machine (Laguna) looks a good build, with water-cooled motor, and a decent bed size. Having some experience now of a CNC lathe, these are a lot more interesting now than just watching robot woodworking! Other than a closeup of that bandsaw blade I was mentioning, these are the guides on one of the bandsaws (one side removed). 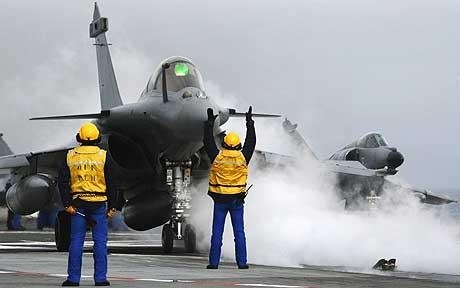 Twin ceramic rectangular plates push in the side of the blade, and a circular ceramic disk behind as the thrust surface. Very nice guide system, and the ceramic would run cool. It would also be a lot quieter. It took pretty much two months to the day to build the cot, given that we were snatching half a day here, half a day there. But first I’ll back up a bit, for a quick summary / overview, and then with more detail from the assembly of the ends. 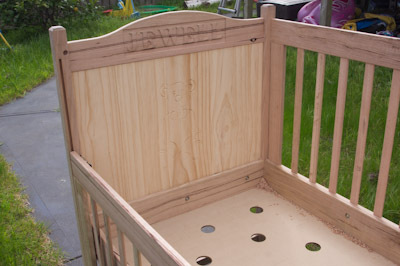 As mentioned earlier, the focus was very much on the planning and construction of the cot, rather than documenting the process. It was glued up in a later session (clamped up with Frontline clamps), with a rail under the bed supporting the MDF bed base. This was also drilled with a series of large holes for ventilation. Session two involved making the slats (and some testing to get the distances between slats right, so it was even over the cot length. Again, the actual glueup happened in a later session. We also resawed, dressed and glued up the pine end panels in this session. A month then passed while we both had other distractions. Session three commenced with a glueup of the various sections. The bed (as seen above), and the rails. 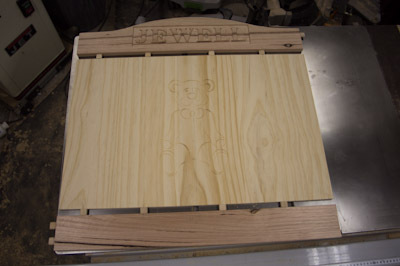 Each end panel had the 3D routing done, and the rails for the cot ends made. Session four was time for the legs to be made. These were each notched so the bed rested firmly on them, transferring the load directly down the legs rather than through a mechanical joint. 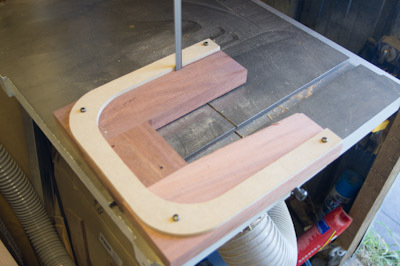 A T Track was routed into the two front legs, using a slot-cutting router bit. By the end of the day (including some extra work done afterwards), the ends were done. This is where we pick up the story. After producing the inserts for the ends (10mm thick pine boards, joined to produce a full panel), routing the 3D pattern into each end, it was time to cut them to their final dimension. 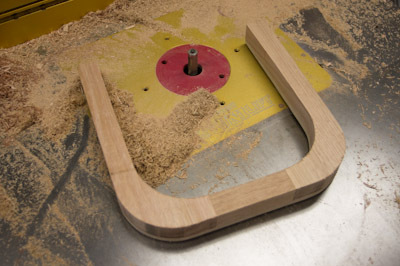 The question is, how to use the tablesaw to cut boards with uneven ends. 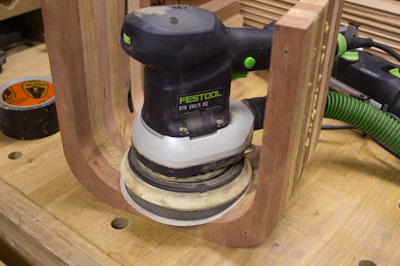 There are a whole host of methods promoted, sleds that clamp down on the piece, extension tables either built into the tablesaw (or added on, such as the Triton Extension Table) etc. Actually, speaking of which, the Triton extension table would have been great for this project, if I had somewhere to actually put it! This project really demonstrated how tight the shed has become. Assembly, and even moving around the larger components was a real problem. Could really do with another shed, either to spread the overall load, or to use more as a project area / workbench area rather than the actual timber shaping/component construction. Back to cutting the panel. 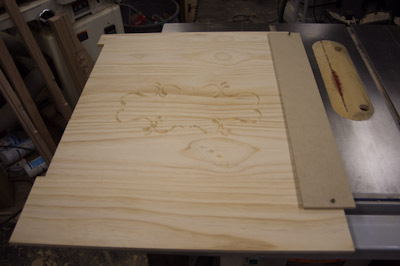 The solution I used was to attach a temporary straight-edge to the board, and it ran along the tablesaw fence, so the opposite side could be cut parallel. In this case it was simply a piece of MDF and a couple of screws into what would become waste. FWIW, I hadn’t set up the saw at this point, changing the blade to a crosscut blade and then replacing the splitter and guard. 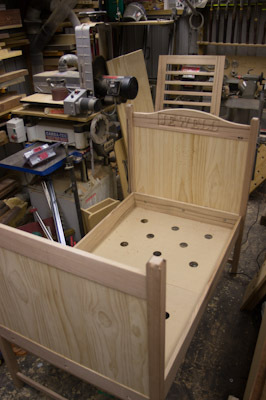 The top and bottom rails were dominoed onto these boards (biscuits could have been used), glued and clamped, then the whole assembly glued and clamped to the legs to form the cot ends. This was done over a number of days (availability of clamps, and time), ready for the final session. Session five – our late night marathon to finish. 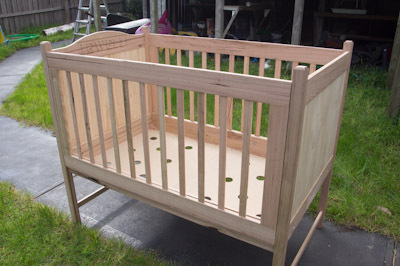 There was a lot of bolting and unbolting of the ends as we finished off the various components and steps, and the beauty of the cot is it can be flat-packed when no longer needed. Just with the ends bolted on, the rigidity was obvious. An extra stringer between the ends would be ideal, but with a combination of bolts and the corners being recessed into the legs is enough. The back rail was added, again bolted to the bed itself, and with dominos into the legs. These were left unglued – more than enough strength left just like that. In time if it proved necessary, a small hole and a piece of dowel inserted through the leg and the domino as a pin would lock them together. The final job was getting the front rail so it was functional. At first it was pretty tight – a roof screw running up and down the track. With quite of bit of trial and error, sanding the track a bit, adding some plastic tube to cover up the exposed screw threads, adjusting the height of the screws so they run cleanly in the track, and finally lubricating the track with Ubeaut Traditional Wax. Whatever it was (and more likely a combination of them all), it went from being a bit average, to running as well as any commercial solution. With spring-loaded catches at the top edge that automatically engage when the rail is lifted, the cot was finished (at least as far as my involvement). Still needs a bit of sanding and oiling, but other than that, a really successful, enjoyable build. 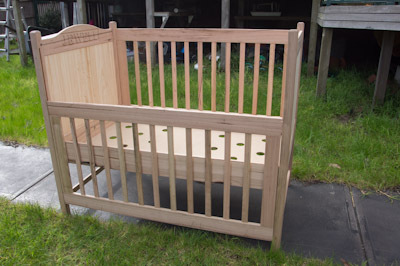 So the cot was done – getting it out of the shed was a mission – we took it out assembled, and it was a rather tight fit (leveraging it around the bandsaw). Getting it into the covered trailer was also interesting. Another 5mm in leg length (perhaps even less), and it would not have fitted. Also in length – it was like absolutely built with the trailer dimensions in mind! So that’s it – another successful project conclusion. There is always that air of relief, satisfaction, remorse, disbelief when a project is over. Fortunately, there is always more timber out there, and so many more projects to build! Well we all know THAT is an exaggeration! However. 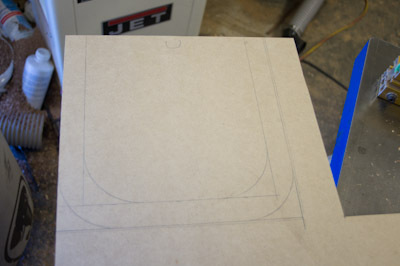 Finally had a chance (and the justification) to fit my new 1″ 1.3TPI, TCT resaw blade on the bandsaw today. Before I get into what I think of the blade, (and as far as bandsaw blades go, it wasn’t particularly cheap), I’ll mention what prompted me to splurge on a replacement blade. I was trying to resaw some kiln dried hardwood (Tassie Oak), that was around 200mm wide. 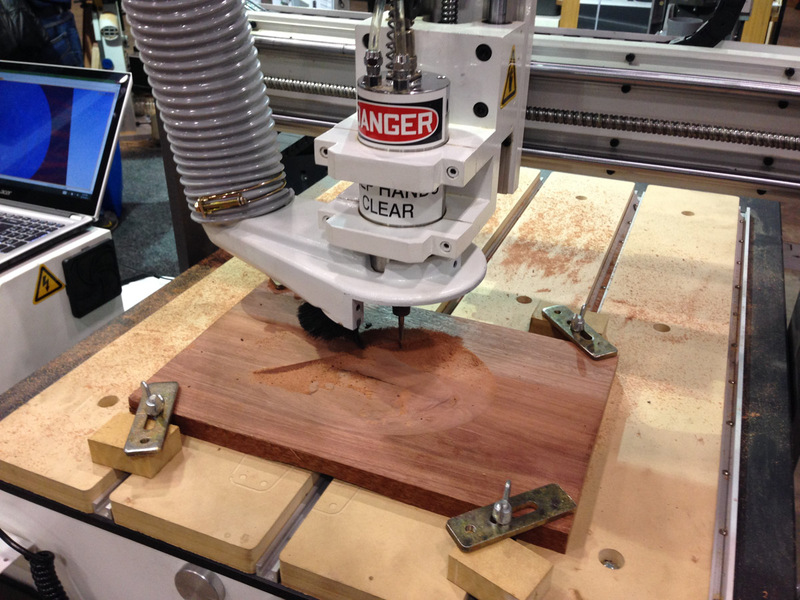 I was using a 1″ 1.3TPI blade that came prepackaged from a woodwork supplier. Not sure if it was a carbon blade, but I strongly suspect so. I was struggling. The blade was complaining bitterly, the amount of force needed to push the timber through the blade was getting stupid (the range of force needed is “butter”, “easy”, “moderate”, “hard”, “difficult”, “impossible”, “dangerous”, “stupid”), and I was blowing the circuit breaker on the bandsaw circuit continuously (it isn’t rated particularly high, so trips way to easily). 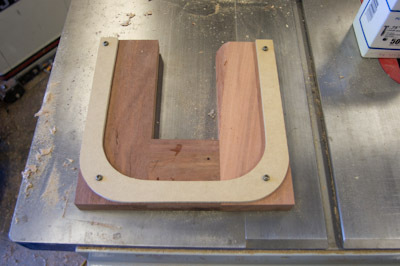 To the point that I was oping for the 15A tablesaw to do the resawing, taking a couple of passes to cleave the timber. So onto today. More resawing required. 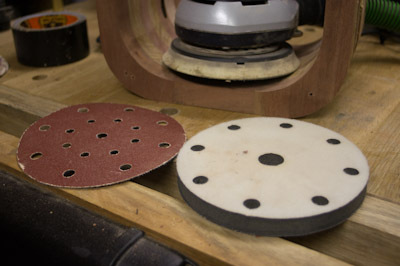 Fitted the TCT blade with a bit of trepidation – what if it isn’t much better? The blade fitted, tensioned, and finally the timber ready to cut. I touched the end to the blade (to make a mark to ensure I was centred). Well I meant to touch the end. Being so used to the previous blade, I put a little bit of pressure in, and immediately sliced into the timber over 5mm. Whoa. Checked I was centred, then fed the timber in, through, and out the other side (1800mm) cleaved in twain without beginning to try. 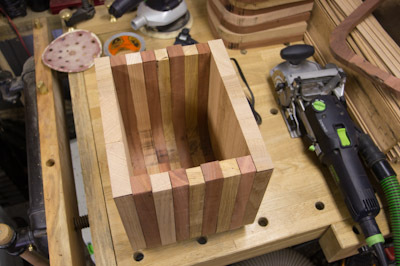 I need a new category for ease – “Soft butter” And this was hardwood. 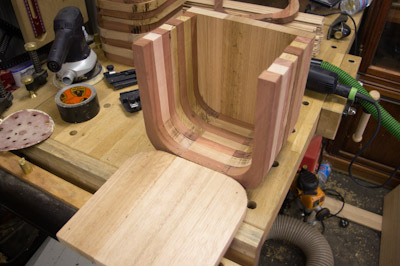 Be very interesting the day I need to resaw some serious Aussie hardwood. Do not expect this blade to have any trouble – wonder how easy it will be! It goes to show, the right blade, a quality blade makes it so much easier, safer, enjoyable. So the blade was $180 or so. After experiencing what it could do, it is worth every cent. Just a pity I can’t get blades thinner than 1″ with a TCT. Not that the bimetal 1/2″ blade has been any slouch either. 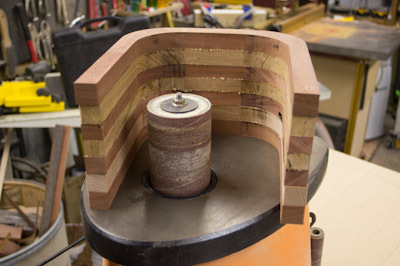 As mentioned earlier, purchased from Henry Bros Saws if you want your bandsaw to become everything it can be! Sounds like a sales pitch (perhaps it should be!) but no. 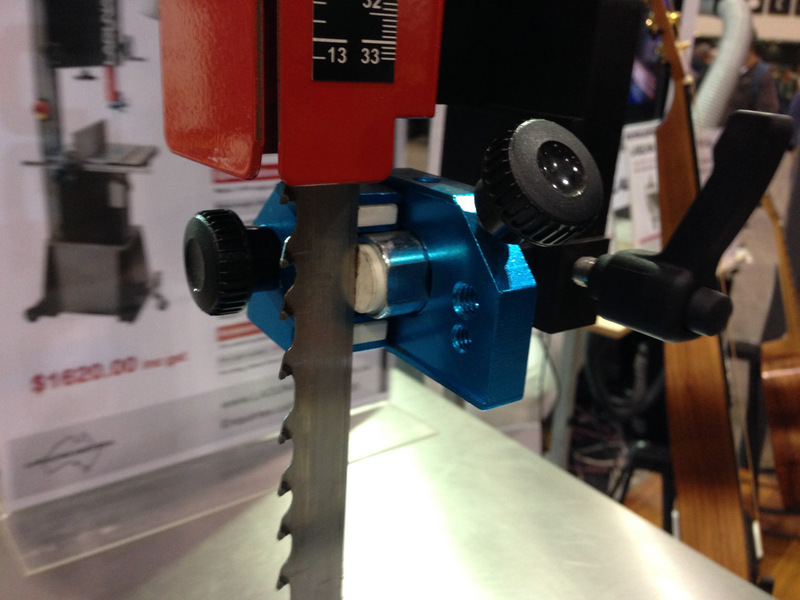 Gave the first new bandsaw blade a quick workout today – the 1/2″ 3TPI bimetal blade. It has a regular tooth set, and slices beautifully. When resawing, it vastly out-performed my current 1″ carbon resaw blade – it is obviously significantly sharper – not surprising given how easily carbon blades dull off. So not only it is superbly sharp, because it is bimetal it will hold that edge for longer. 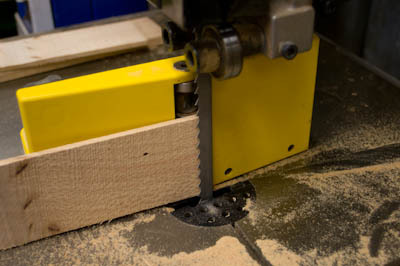 I guess I have found my new “standard” blade – the one that will stay on the bandsaw by default, so whenever I want to do a quick cut without going to the trouble of changing blades, this is the one that is a jack of all trades. So yes, very happy with this first blade, and looking forward to testing the others. The general rule is to have as few teeth in the cut as possible. Too many, and the gullets fill and clog and the blade cannot cut well. Too few teeth, and the cut is rougher than is necessary. Having a range of blades, sizes, tooth configurations, tooth numbers will mean you will have the best blade for the job. Straight-faced tooth with deep gullet to remove shavings. Deep gullet and 10o undercut face which digs in more, and tends to curl the shavings. Good for harder woods. I would imagine though, that it is likely to dull off quicker, given there is less material backing the tooth edge up. Similar to Hook Tooth, but has the teeth at 90o . 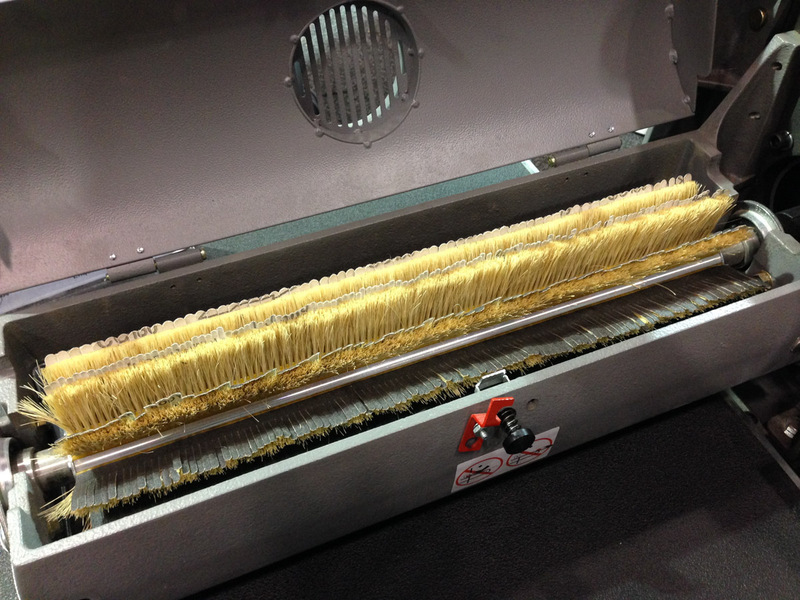 Chips rather than shaves – good for materials that would otherwise clog up the blade. Effectively increases the gullet (which clears the formed chips out of the cut), without having to increase the overall tooth size. Has a combination of teeth closer together for a finer finish, with some teeth having large gullets for chip clearance.